February 2012 saw the start of an exciting new era for Toyota in Toowoomba, with the inception of Toowoomba Toyota. During the past seven years, the business has grown and the staff has expanded to over 90 local Toowoomba Employee's. At Toowoomba Toyota Dealer Principal Brett Motton, along with the staff are focussed on our Guests and their experience. We strive to exceed our Guests expectations and create a vehicle Sales and Service experience of a lifetime at every touchpoint. Toowoomba Toyota has well and truly cemented their footprint within the Community. Exclusive Vehicle Sponsors of YellowBridge Qld and we are also involved in helping out many other Organisations within Toowoomba. 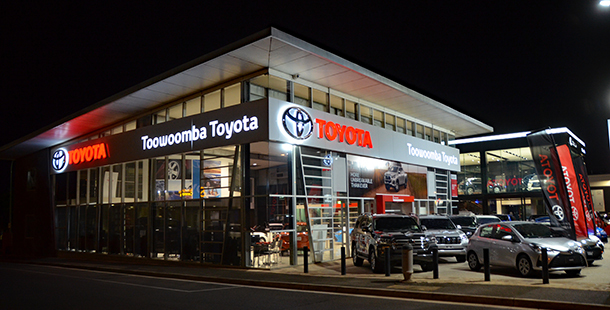 Toowoomba Toyota is located on 597 Ruthven St, and is a familiar landmark in Toowoomba. Toowoomba Toyota has added to this with the incorporation of our Genuine Parts and Accessories Department into our Service Department. This expansion has seen a streamlined approach to vehicle servicing and further enhances our Guests after Sales Experience! Our purpose built Parts warehouse has been designed to support our Guests needs and enables us to stock a wide range of Genuine Toyota Parts and Accessories. This spectacular facility compliments the existing Sales complex and further confirms Toowoomba Toyota’s ongoing commitment to our Guests.